So I finished layout work on the Road to Hell last night, all bar pouring over it and checking for typos and layout gaffs. In a way I’m sorry, It’s been the most fun I’ve had working on any of my books. Partially because I’ve got my head in a place where I’ve made that happen, partly because Lamentations of the Flame Princess is just damn well written and a ton of fun to play/write for, but also because of the ace folk who have worked with me on it – from the production crew (Jon Jonny Hodgson, Daniel Barker, Peter Town, Glynn Seal and last but not least Paul Mitchener), the Kickstarter backers who played the various KS promo-games (“name your cultist” and “mention it on social media and I’ll make you a werewolf” ) and the folk who have played it with me during the playtests. 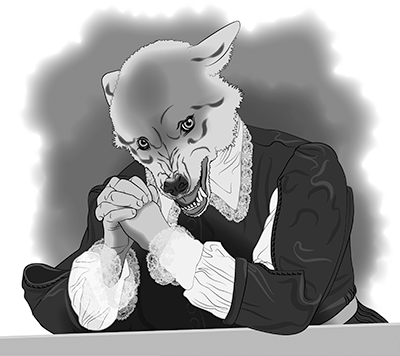 If you missed the KS it’s going to pre-order soon, but I’ll leave you with one of Daniel Barker’s wonderful illustrations of Lord Nick Woulfe of Toft Hall (which is part of Nick Brooke’s prize for winning (along with Neil Benson) the “mention it on social media and I’ll make you a werewolf” KS promo-game). This entry was posted in Lamentations of the Flame Princess and tagged Daniel Barker, The Road to Hell by Newt. Bookmark the permalink.